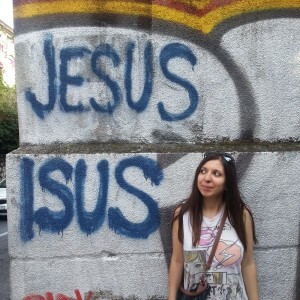 Spring is here and the weather is beautiful. 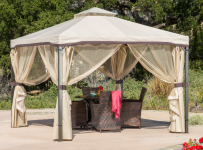 If you have your own backyard, we are sure that you’re thinking about buying perfect patio furniture for dining that you could use with your friends and family at your outdoor gatherings. 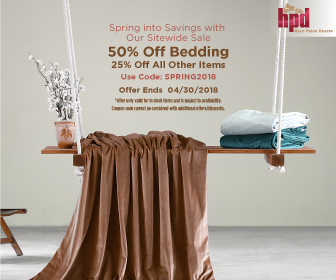 We tried to make this job easier for you, so we found some beautiful outdoor sets that are perfect for every backyard, no matter if it’s smaller or bigger. 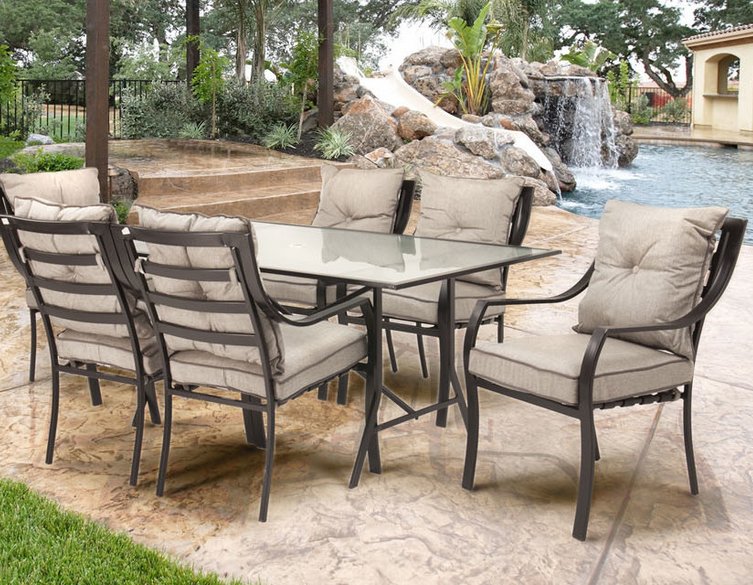 This charming dining set is a perfect furniture for your patio. It includes a glass topped table and six comfortable chairs, complete with cushions. This table is a perfect combination of a modern, sturdy design and a classic comfort. Frames are constructed of rust-resistant, heavy-duty steel and have been powder coated to a long lifetime of use. 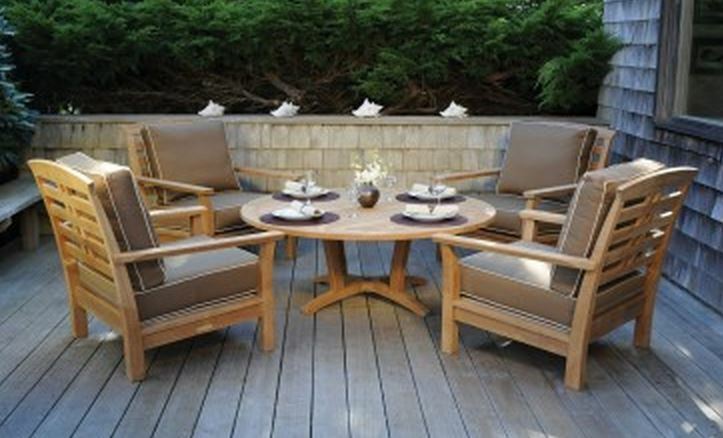 Loft Outdoor Dining Set by Elan Furniture is designed for years of relaxed, outdoor enjoyment. The set includes one table and six dining chairs. Powder coated aluminum table frame is crafted from a 2″ aluminum profile and the beautiful, All-Weather top is crafted from genuine PolyTuf HDPE. 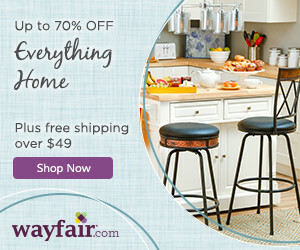 The table is made in the USA, and it comes with 20 years of warranty provided by the manufacturer. 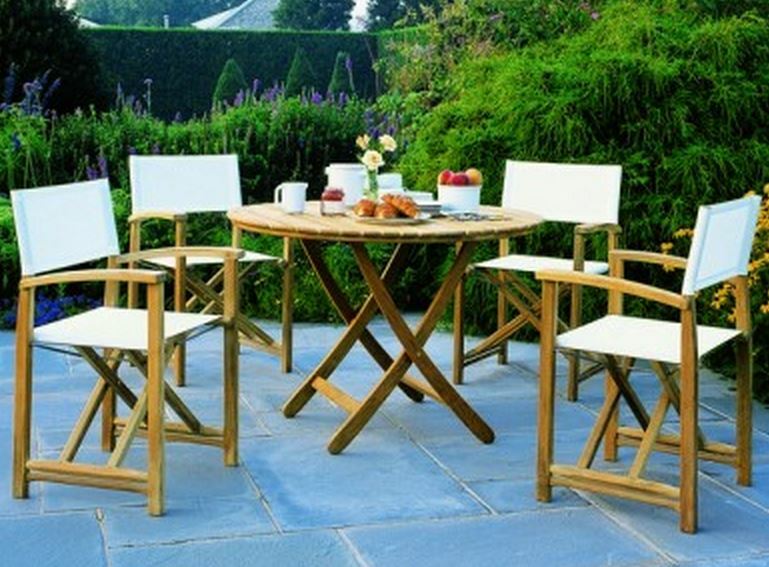 This Kingsley-Bate dining set is a beautiful addition to every garden. At 21″ high, it’s taller than a standard coffee table in order to be suitable for low dining, but you can also use it comfortably as a coffee table. The set includes one table and four chairs with cushions. Also, you can choose from the many fabric colors from the grade A color selection (additional surcharge for grades B,C,D,E). There’s another beautiful outdoor dining table by Kingsley-Bate. This one is much more affordable, but still beautiful, modern and simple. It folds for easy storage and numerous chairs and comes with an umbrella hole and plug to accommodate our 9′ market umbrella. The set includes one round table and four beautiful and comfortable chairs. If you’re a fan of classically designed furniture, Classic Coastal Avalon Wicker 5 Piece Dining Arm Chair Set is a perfect choice for your patio. 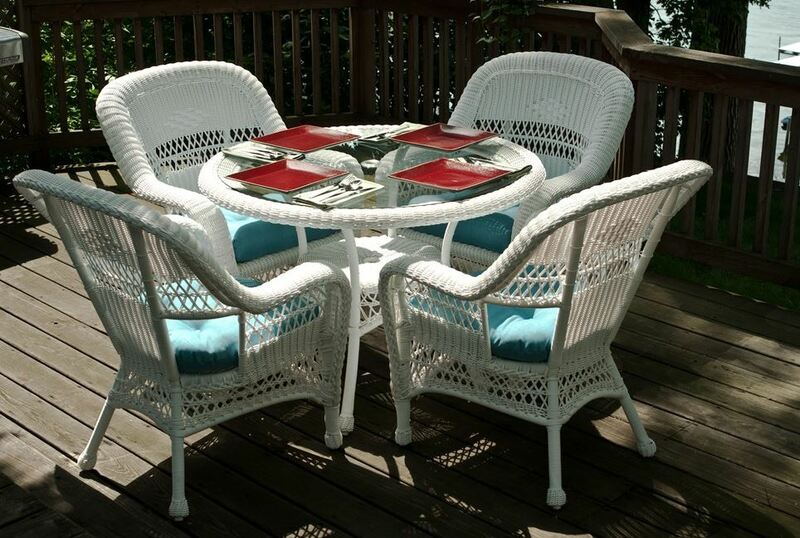 It is available in multiple all-weather wicker colors. 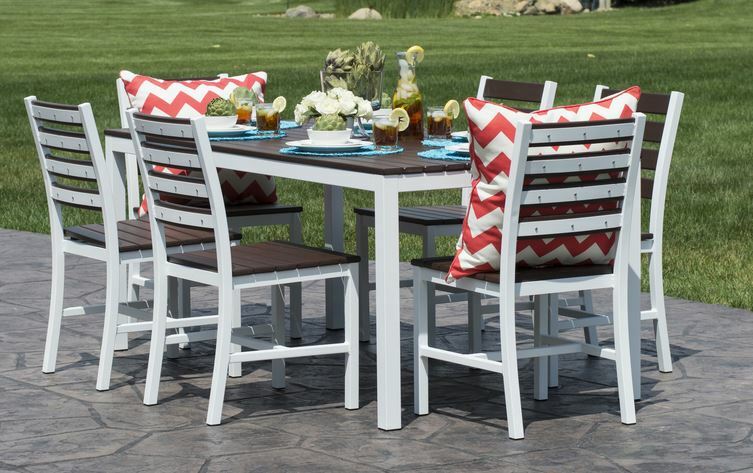 The set is made for a smaller porch or a smaller backyard patio. It comes with a 3 year frame warranty, 2 year wicker warranty, 1 year cushion warranty. 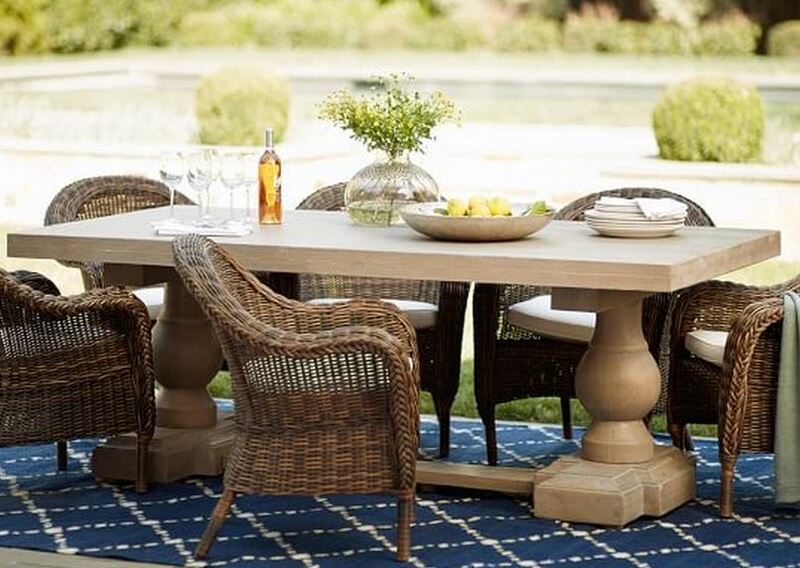 Scarlett Rectangular Dining Table & Torrey Chair Set – Espresso is a beautiful addition for a big backyard patio and it could be a an impressive centerpiece at your outdoor gatherings. 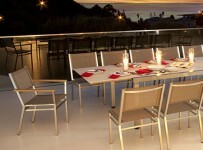 It includes one big rectangular Scarlett dining table, and six comfortable Torrey roll armchairs chairs. 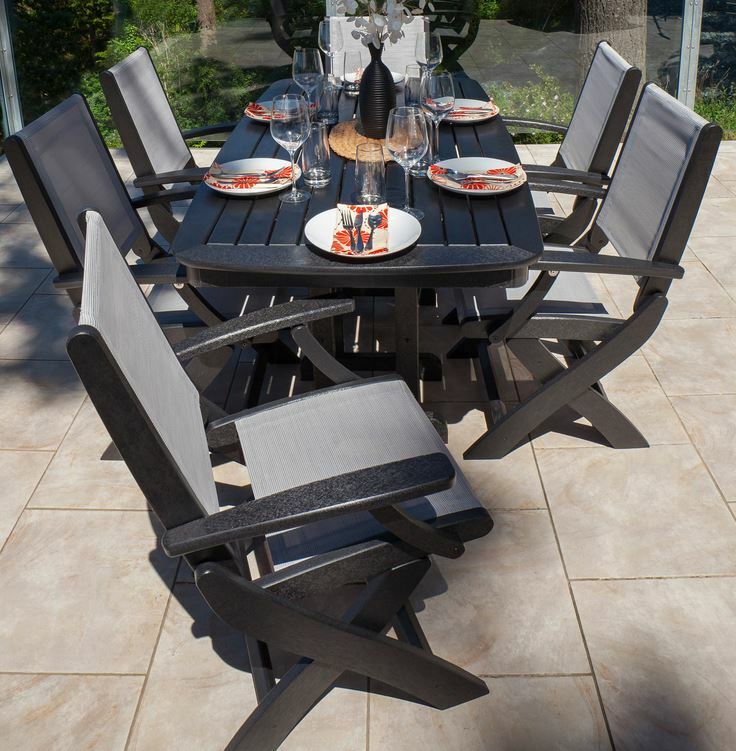 This Coastal 7 Piece Dining Set by Polywood is a modern and comfortable outdoor furniture set, perfect for bigger backyard. Frames are constructed of solid POLYWOOD® recycled lumber that has the look of painted wood but doesn’t require the maintenance associated with real wood. The set includes six Coastal folding chairs and Nautical dining table.